In the process of getting my 1962 Edinboro done using a product developed by the same guy st a new company. Thanks Dave. I have read where some glass top quarter inch. How do you plan to top off. If you are on the Potomac then you are pretty close to carbon core. They are in VA on Rt 29 just north of UVA. 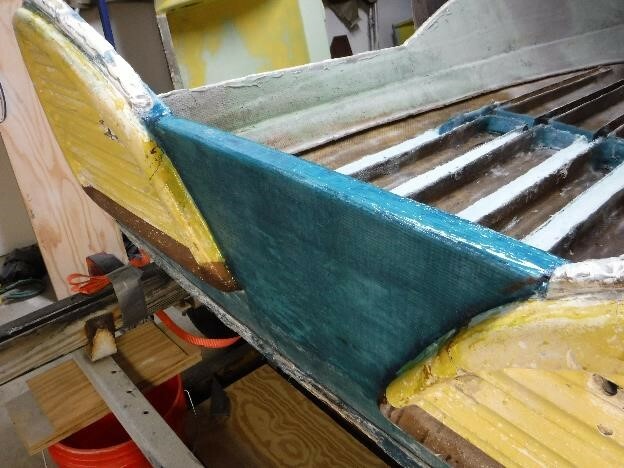 I used seacast for my transom rebuild and will put together a video when complete. Sabine at sea cast has been great to work with. I'll be getting the new floor panels from carbon core in a few weeks. As they offer large 4' x 8' premade panels skinned with 1708 and I can go pick them up. I fabricated a new inner and outer skin, filled with seacast, inserted a 1708 cap per Sabine, smoothed with a little more sea cast sauce, ground a radius on the outer edge of the panels and applied a full 1708 top cap. Now on to the stringers. Carbon core is a ceramic base mix and seacast is a resin base mix with recycled fiberglass fibers that you mix in.I think it was very easy to use. I have a Lake n Sea waiting in the woods in Indiana for the same. Looks like you just cut the glass off the top of the stringers and cleaned them out? Now are you just going to fill with seacast? yes, sliced open with a cheap harbor freight multi-tool with metal cutting half moon blade. 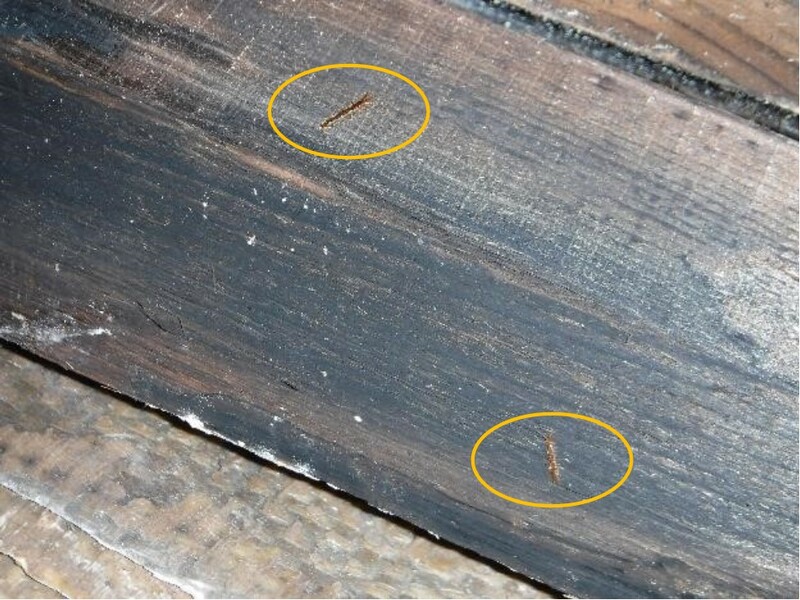 Wood looked good on the surface but was rotten and riddled with worms inside and below. 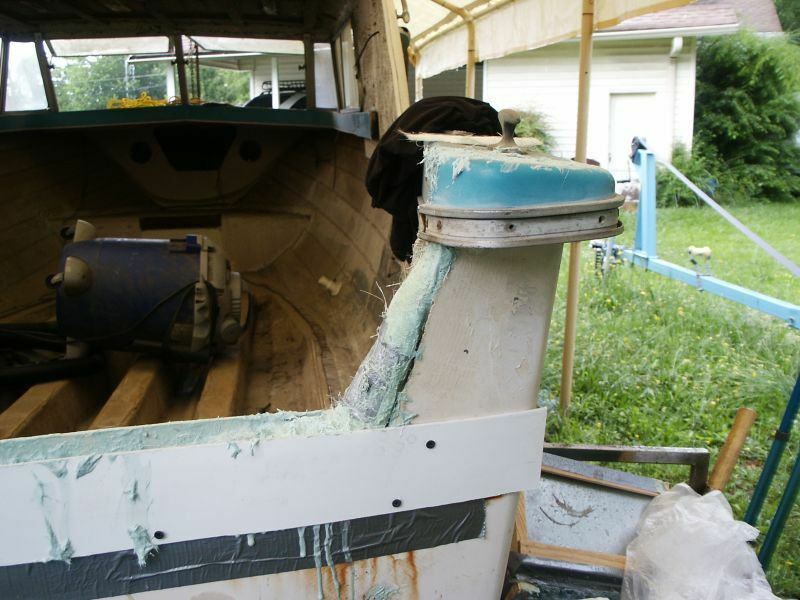 I'll post the complete sea cast transom repair as soon as I compile all of the pictures. Picked up Carbon-Core today from manufacturer for Westfield transom repair. Nice ride in the country. Company provided helpful tips. Now the fun begins. Will let you know how it goes. Thanks for the lead. i feel like an old pro now. i can say i looked at all the different products and the tech help i got from seacast was the deciding factor, i called enough times to put them on speed dial . i followed the groups advise and my aluminum cap was about the only thing that didn't rot. 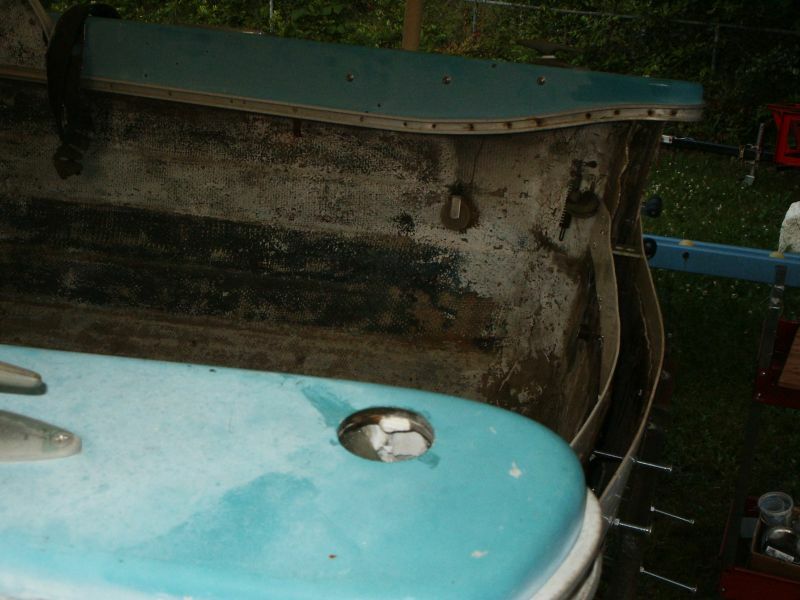 i drilled out the rot (which i found out had started from the bottom up and the little bit of wood under the cap was the driest then as i went into the transom it was wetter and wetter. i bought a little drum sanding barrel and sanded the wood off the skins . i bought seven gallons of seacast, for my fill. i made a template from wrapping paper and marked it off in 1 inch squares. then just counted up the squares i got my square footage that way. i was hesitant to screw up that much money but once i started it went just like the promos. then i capped it with some glass and sanded everything back down note* some cut blocks to fill in the ears where you can't pour, i drilled 1 1/2" holes in either rear cap and dammed up the ears with aluminum and poured it directly through into the ears or wings, then i get one solid piece of transom. seacast is a top product . 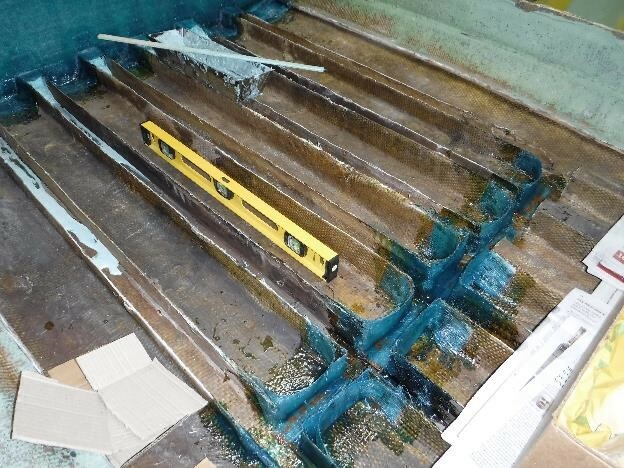 when i bought the boat it had sat out in the weather so the floor would fill up with water drain down into the bottom, that's hoe the transom rotted. Looks great! My brother used Seacast for his 1965 Edinboro about 12 years ago and still holding up. 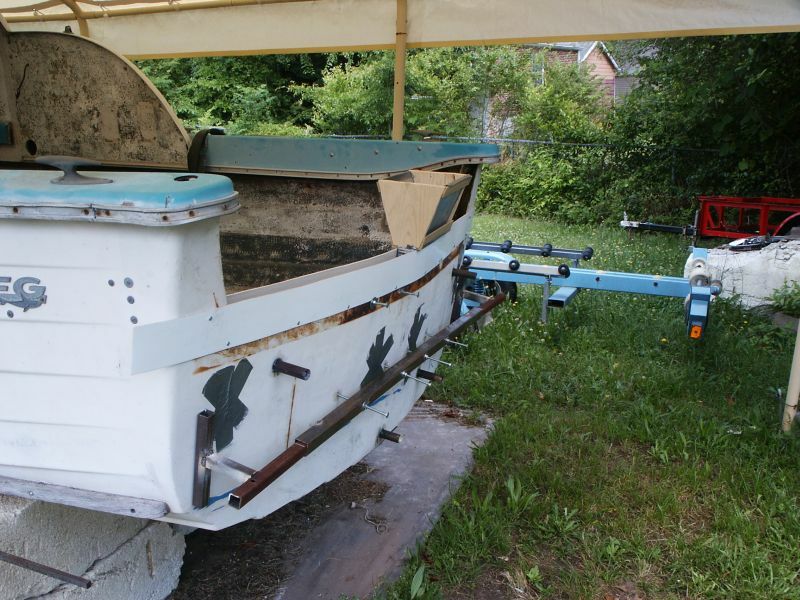 Is your boat a 1960 or 1961 Seaway Cruiser? I've never seen one before - they must have made very few of those. 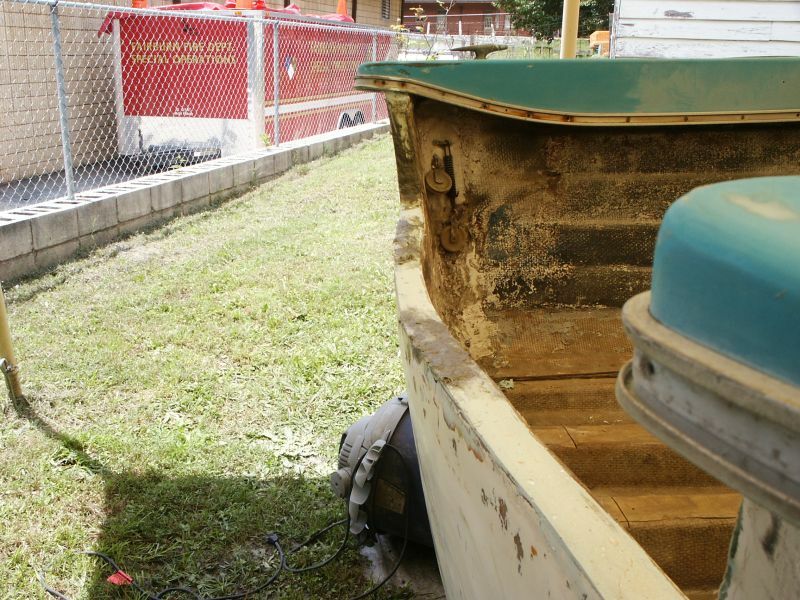 The tip-off was the deck and cabin shape. 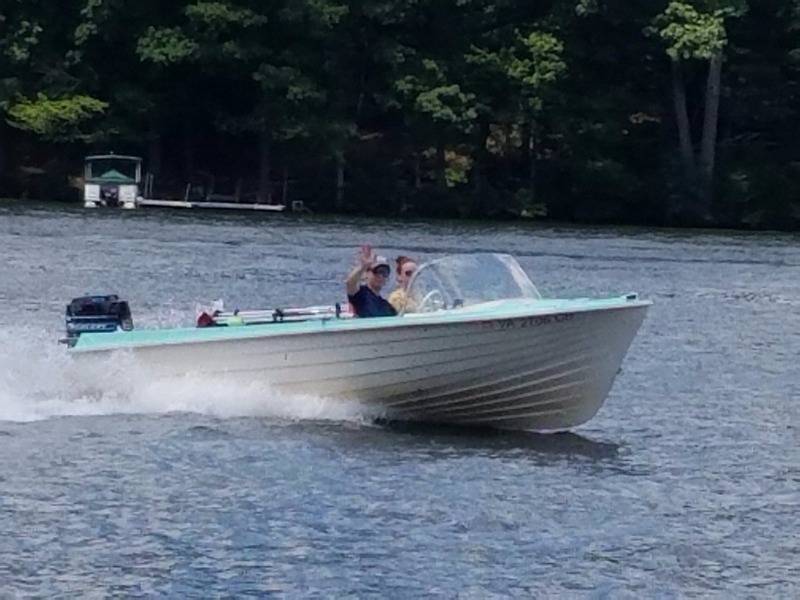 It was also a little larger than the 1964+ Sea Cruiser. Good job! I'll post some pictures once I have some of the pour for CarbonCore CarbonBond on my 1962 Edinboro. Just completed transom repair using CarbonCore. Highly recommend this product. Pours like molasses. If I can use it, anyone can. 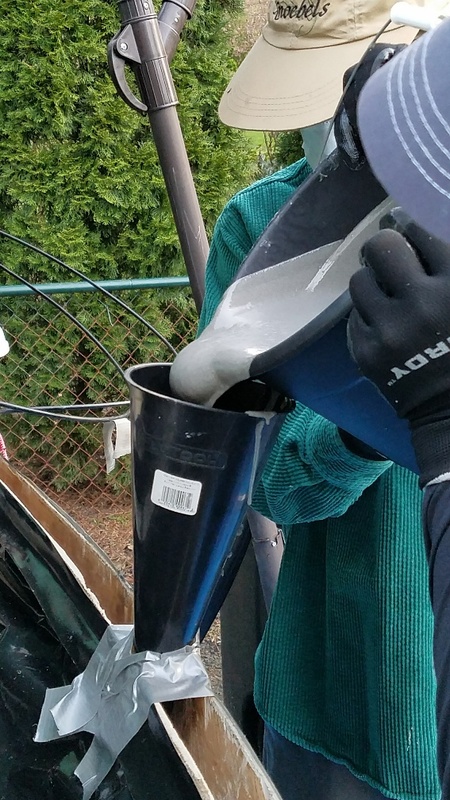 Cost around $300.00 For two five gallon buckets. You get about 20 minutes to pour. Product hardens like lightweight concrete and alledgedly floats. 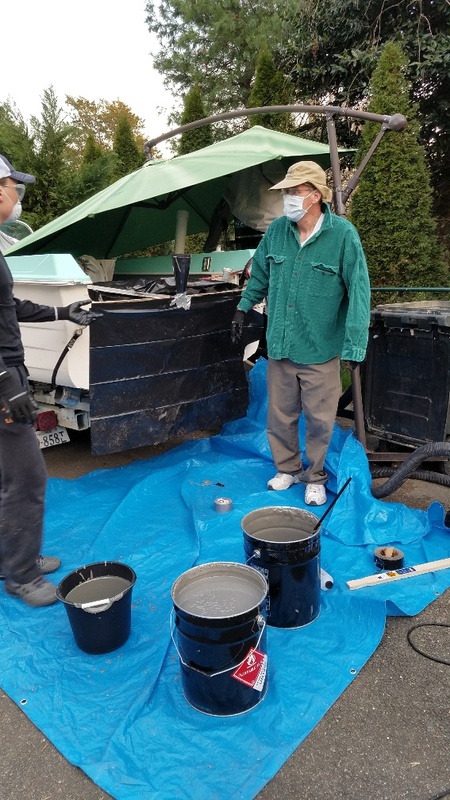 Mixed with small amount of liquid MEK provided by seller using steel paint mixer from Harbor freight. Product easily poured like molasses. No need to force poduct into transom. All holes can be simply covered with duct/gorilla tape. Left in engine bolts covered with wax. Bolts were easy to remove once product hardened. Filled to top of transom. Leveled off top with stick.Taped up corners with duct tape and filled with product that I let get sligtly cured like mush and forced into corners. No need for fiberglass cap. Once product hardened, simply screwed old metal cap into product.Product did start to harden before I could finish (my fault) resulting in me needlessly cursing out my awesome helpers ( Wife and son). I did complete project with one pour. Some break it into two. I also started project right before dark. Protected fiberglass with plastic garbage bags and Duct tape. Anyone can do this. Relatively Easy. Transom demo was a challenge which I will document in separate post. I also plan to post photos. Thanks Dave for the Carbon Core tip. 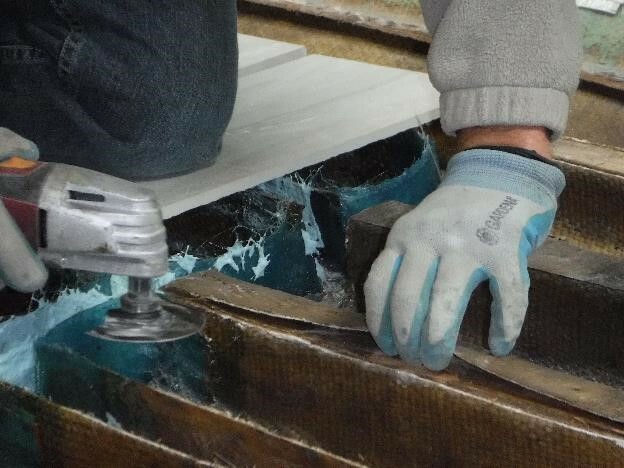 Photos for CarbonCore transom repair on MFG Westfield. 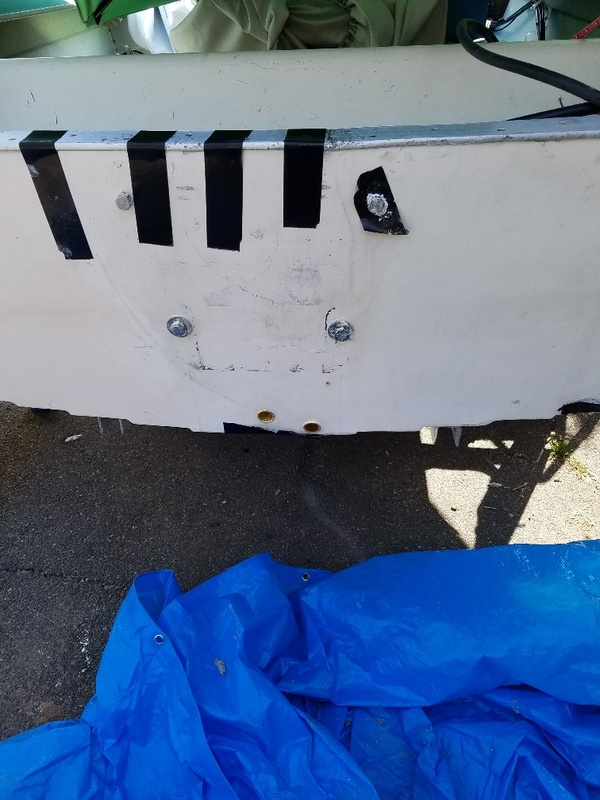 Thanks for the post on transom repair with seacast. Wondering if you know how much weight it added to your MFG. I had calculated that it would add about 40 pounds over a plywood transom. That's either Seacast or CarbonBond. They weigh about the same per unit of volume. One detail that's a bit easier with CarbonBond. 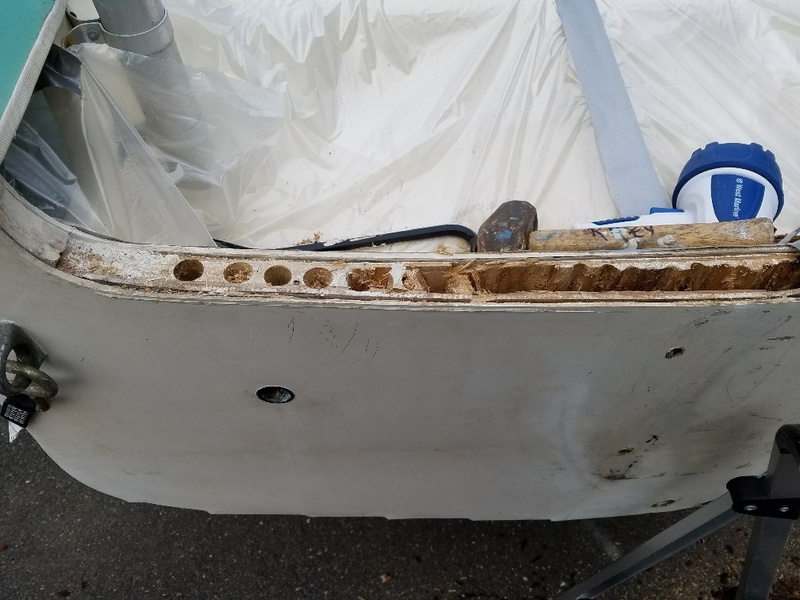 For the corners of the transom that are each higher than the rest of the transom, we drilled a two holes, one above the other with the top hole just under the deck. Squeezed in the material until it came out the top hole, just like a gear lube change on an outboard. Worked like a champ with no voids anywhere in the transom. Seacast is a bit too thick to easily do that. 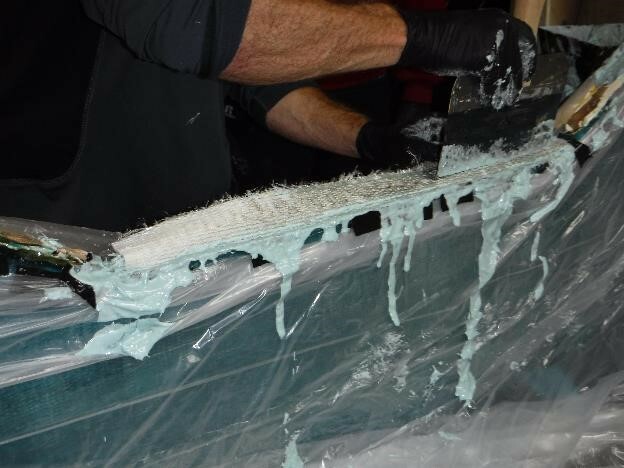 Was smoothed then gel-coated over the top, which was CarbonBond with the fiberglass skin on either side. Then the aluminum trim piece was repaired, polished and screwed down into the transom, as before. 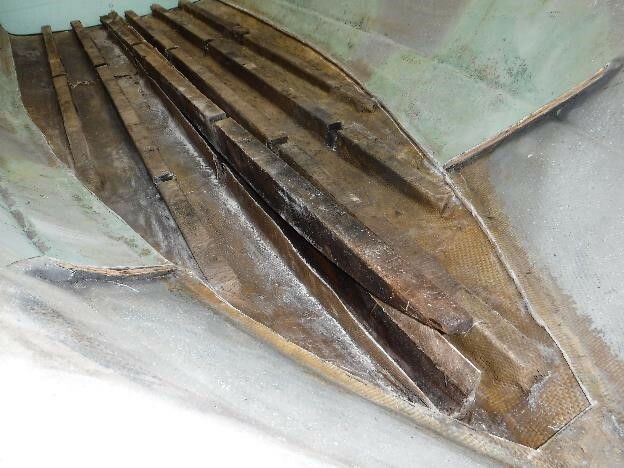 Carbon core Transom job on 1964 Westfield complete. See attached photo of kids enjoying ride on Deep Creek Lake, Md. Thanks for all the tips. from my understanding i have the only one so far.